Starling Fitness - Fitness, diet, and health weblog » Ask Laura: What Heart Rate Monitor Would I Buy? Ask Laura: What Heart Rate Monitor Would I Buy? Are you recommending the Timex Triathlon Digital HRM? If so, how do you like it? I might be in the market for a new one. I’ve had my Timex Ironman Heart Rate Monitor for over six years. It is really accurate and the velcro strap makes it really easy to attach, even though it sticks to my clothes sometimes. I’ve replaced the batteries, but I haven’t had a bit of trouble with it giving me weird readings, now that I learned the KY Jelly trick (see Starling Fitness Â» How To Get The Most Out of Your Heart Rate Monitor). I bought it because it was cheaper than the Polar heart rate monitors that were around back then. Now, I think Polar makes a bottom of the line monitor that’s close to the Timex in price. I can’t compare because I’ve never used Polar. I think some exercise machines at my gym will work with Polar Heart Rate Monitors and let me use their cardio programs, but I’ve never tried anything like that. If you go to a gym, that might be a consideration. Talk to the people at your gym and see if they have any recommendations. 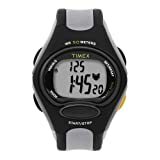 I think if I had to buy another heart rate monitor, I would go with the women’s Timex Ironman just because the one I had was so easy to use and it lasted so long. Plus, I have all that 1970’s marketing in my head. How can I escape that? Seriously, though, heart rate monitors are just tools and they won’t make us any fitter if we don’t use them.